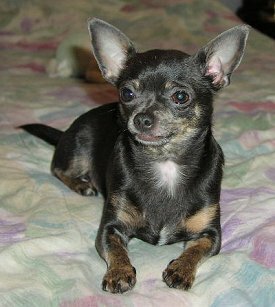 Mouse is a 14 and a half year old Chihuahua with a neurological disease and disk disease. I used the Assisi Loop device to try to help her inflammation and pain. I'd like to tell you how I used a prescription veterinary device called the Assisi Loop as part of a treatment program for our 14 and a half year old Chihuahua. "Mouse" is a rescue dog who was born with a number of genetic ailments, including syringomyelia (suh-rin-go-my-eel-ya), a serious neurological condition. It is a deformity of the skull and spinal cord that interferes with the free flow of spinal fluid. So this fluid builds up in her brain, causing small seizures (controlled with medication). Other symptoms include painful tingling sensations that makes her lick her legs obsessively. She also can't feel or move her front legs very well, so she has trouble walking. To make matters worse, the vertebrae in her neck are messed up, also known as intervertebral disk disease (IVDD). 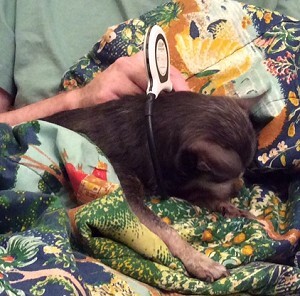 Mouse has her very own neurologist. Also a holistic vet. They each contribute different things to her treatment program. A good treatment program....but syringomyelia is progressive, so I kept researching for new treatments. That's when I discovered a medical device called the Assisi Loop. The Loop comes in two sizes: 4-inch diameter (perfect for Mouse) and 7.5-inch diameter. Diameter means the width across the loop. The Assisi Loop produces a targeted pulsed electromagnetic field (tPEMF), which helps speed healing for inflammatory or painful conditions. Think "arthritis, hip dysplasia, herniated disks, pancreatitis, colitis, injuries such as fractures and skin wounds, and....."
Could it be useful for Mouse's disk disease and maybe even her syringomyelia? Now I am a skeptic by nature. I have serious chronic pain conditions myself. So I have learned not to fall for "miracle cure-alls" that do nothing other than increase how much you owe on your credit card. I wasn't about to try anything on my precious little girl that didn't pass my research criteria. So I was pleasantly surprised to discover that the technology in the veterinary Assisi Loop is based on the same technology that is FDA-cleared for human health issues. There are a number of published peer-reviewed studies that show how and why PEMF therapy works on inflammation and pain. In a nutshell, here is how the Assisi Loop works. On each side of the Loop, the electromagnetic field extends 2/3 the diameter of the Loop. 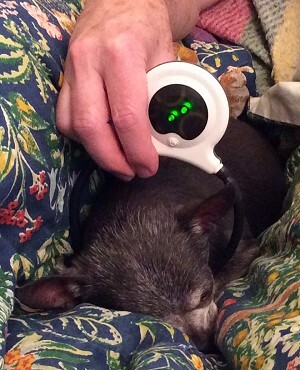 You place the device on your dog's body and turn it on. Powered by a battery, electricity runs around the metallic loop in a pulsing pattern (the frequency increases and decreases). This produces an electromagnetic field. The field causes a microcurrent (a tiny electrical signal) to flow into your dog's tissues, stimulating the tissue cells to produce nitric oxide, a molecule in your dog's body that is instrumental in the healing process. The discovery of nitric oxide's role in promoting healing was awarded the Nobel Prize for Medicine in 1998. Mouse just sleeps through her treatments. My husband (Mouse's Good Daddy) was actually the one who did her treatments. First he pressed the button that turns on the pulsed electromagnetic field. Then he slid the loop over Mouse's head so the tiny electrical signals would flow over her brain in one direction, and over her cervical (neck) vertebrae and spinal cord in the other direction. If you have a dog with pancreatitis or a skin wound, you can lay the Loop on that part of the body. For leg injuries, you can slide the Loop over the leg. You can't see the field, or feel it. Mouse just sleeps through her treatments. Assisi recommends starting with 3-4 sessions per day for a couple of weeks. As healing takes place, your vet may decide you can drop to 1-2 treatments per day for awhile, before phasing it out entirely. Chronic conditions may benefit from continued treatment once or twice a week, or during a particularly bad flare-up. Each treatment session is 15 minutes. The battery automatically turns off after the 15 minutes. 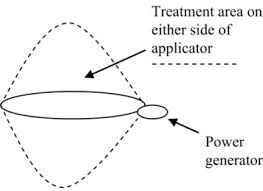 The battery powers a certain number of treatment sessions – then no more. It's not rechargeable nor replaceable, which means when the battery is done, the Loop is done. Assisi says you get at least 150 treatment sessions from a battery. We got 225 sessions from ours. Now, depending on your dog's health issue, when the battery runs out she might be healed and need no more treatments....great! But if she has a chronic or degenerative condition such as arthritis or disk disease, she may need some ongoing treatment and you would need to purchase another one. A Loop costs around $300, including shipping. Some good news....since the Loop is veterinary-prescribed, many pet insurance programs will cover it. If you have pet insurance, definitely call and ask! Is the Assisi Loop the only electromagnetic device available? No, I found other devices claiming to do the same thing as the Assisi Loop – magnetic beds your pet can sleep on, or devices that don't require a prescription. But they all deliver lower doses of the PEMF signal. Or signals that aren't pulsed. Or signals that aren't targeted specifically to those essential nitric oxide channels. Mouse sleeping on her daddy's lap. None of those devices had the credentials of the Assisi Loop, which was designed by a professor in the Department of Biomedical Engineering at Columbia University and the Department of Orthopedics at Mount Sinai School of Medicine. Assisi Loop. Strong signal. Pulsed. Targeted. I read the human studies. I read the first-hand stories from physicians, human patients, veterinarians, and pet owners, who reported positive results with no side effects. They, in turn, were impressed with my website. So they sent me the device at no charge, in exchange for my using it with Mouse and writing an honest review of my experience. If you've been reading my site, you already know that I give my honest opinions about everything. Positive and negative. In the banner at the top of this page, it says "Honest Advice About Dogs" and I mean that. So you can rest assured that I am writing exactly what happened after trying this device on Mouse's bad cervical disks and on her brain and spinal cord. When I was researching potential new treatments, I was actually looking for a treatment for a DIFFERENT health issue. Poor little Mouse had just torn the cranial cruciate ligament (CCL) in the knee of her right rear leg. Sometimes it's called an ACL rupture. Same thing. The cruciate ligament holds the bones in the knee in proper alignment so the knee joint works. There's the thigh bone (femur) and the shin bone (tibia), with a couple of ligaments between them, holding them closely together. When a ligament is torn, the connection between the two bones becomes looser. With each step, the bones slide forward and backward, grating against each other. Ouch! Inflammation, pain, limping. With two weak front legs from her syringomyelia, and now an injured rear leg, Mouse had to shift most of her weight to her only remaining good leg. What to do? Other than to shed tears (which we did). Well, the only two choices are conservative management or surgery. And neither of those options actually heals the torn ligament. Once torn, always torn. Instead, conservative management and surgery have the same goal – to try to keep the two bones from sliding back and forth until enough natural scar tissue has formed to stabilize the joint. Then the dog can put at least some weight on the leg, even if she can't bend it very well. Scar tissue is tough and strong, but not very flexible. With Mouse's age and neurological problems, we chose conservative management. Turns out, it's pretty much the same treatment program for CCL tears, with a slightly different blend of herbs and nutritional supplements (notably ligaplex and glycoflex, which help ligaments and joints). Some owners add a custom-made polypropylene knee brace. A custom brace lends support so the dog can bear some weight on the leg while still holding the bones in place so the scar tissue can form. But fitting a brace to a 5-pound Chihuahua is difficult, so we decided to save this option. It takes a long time for scar tissue to form, from several months to a full year. Sadly, some dogs (mostly over 30 pounds) don't respond to conservative management and then surgery is your only other option. Unfortunately, a surprisingly high percentage of dogs don't respond well to surgery, either. So.....what about the Assisi Loop? Could it help heal a cruciate ligament rupture? I learned from multiple medical sites that a pulsed electromagnetic field could affect scar tissue by helping it turn into normal tissue. Now, for most health conditions, that is a very good thing! Scar tissue is tough and fibrous and when too much builds up, it restricts flexibility. So for conditions like arthritis, disk disease, skin wounds, etc., helping scar tissue turn into normal tissue is a great benefit. for holding canine knee bones together. "PEMF does not interfere with scar tissue formation (as far as we know). It does appear to assist scarred tissue in remodeling, which means returning to normal tissue. If there is any remodeling here, it might reduce the scar tissue strength. So probably wait until we have more data." Well, darn! On the one hand, the Assisi Loop could help with the inflammation and pain of the ACL tear. On the other hand, it might make that essential scar tissue formation less strong. After a lot of agonizing, and after speaking with a helpful veterinarian at Assisi (excellent customer service there! ), we decided not to use the Assisi Loop on Mouse's torn knee ligament. But we DID try it for Mouse's disk disease and syringomyelia. The Assisi people expected us to see good results in 2-6 weeks. Unfortunately, after 8 weeks, we saw no improvement. No difference in her ability to walk with her front legs. No difference in the tension or tenderness in her neck or shoulders. No difference in her medication requirements. Summary: After 8 weeks, no improvement. The Loop would probably do better with a different dog or with different health issues (especially arthritis or other conditions or injuries that include inflammation or pain). Sadly, it did not work for Mouse. 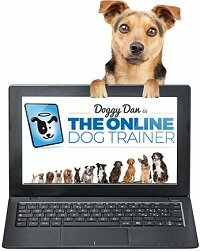 If you want a big head start on learning how to provide the best daily care for your dog, start by reading my book, 11 Things You Must Do Right To Keep Your Dog Healthy and Happy. 11 Things You Must Do Right To Keep Your Dog Healthy and Happy is a real eye-opener. Very readable and easy to understand.